Black and white illustration from a children's book, hand coloured. 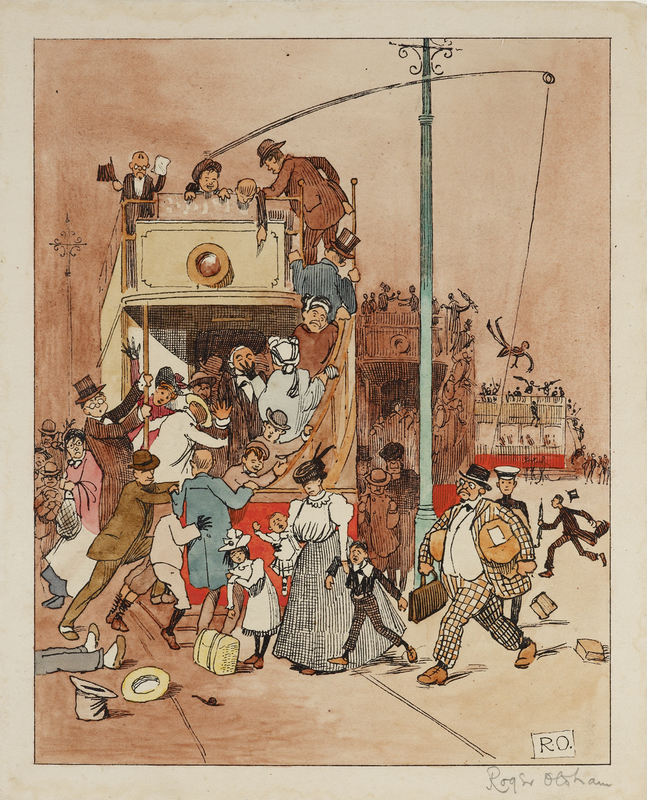 A chaotic scene depicting a doubledecker tram seen from behind, laden with passengers. More passengers from the street are attempting to climb aboard. In the distance can be seen two more trams, equally busy. Some pedestrians have tripped and fallen in the road, while others are tumbling from the trams' top decks. A row of figures closest to the viewer show, from left to right, two men attempting to board the tram, a family group of a well-dressed woman with two children and a baby, and a large man in checked suit carrying a suitcase. The accompanying poem reads "T for trams. The Tram Cars glide about the streets/As if they were alive,/And men and women fight for seats/Each night at half past five." This is a laminated sheet or similar in side pockets of benches in G15 A Manchester Alphabet Roger Oldham’s book A Manchester Alphabet was published in 1906 by John Heywood. Oldham (1871-1916) spent most of his life in Manchester, and his Alphabet is an affectionate and humorous record of his home city at the beginning of the twentieth century. The works displayed here are a complete set of hand-tinted printer’s proofs for the book, coloured by the artist himself. Oldham attended Manchester Grammar School, leaving in 1887, age 16, to work in the architectural firm of Charles Heathcote. (The school is commemorated in ‘O is for Owl’, with the owl being the symbol of the school.) illustration of owl here: photography taking place June 1 2016 A Manchester Alphabet contains locations still recognisable today – the Town Hall, King Street and Manchester Art Gallery (depicted in the illustration ‘P is for Picture Gallery’) ¬¬ – as well as many areas now lost to history (Bellevue Zoo and Greenheys) or transformed beyond recognition (Ancoats and Shudehill). Oldham’s book is a celebration of Manchester, focussing on the city’s vitality (‘E for Exchange’; ‘X for Exodus’), its position at the forefront of technology (‘M for Motorcar’; ‘T for Tram’) and its illustrious past (‘D’ and ‘J’ refer to pioneering scientists John Dalton and James Prescott Joule, while painter Ford Madox Brown appears in ‘F for Fresco’). Yet it does not shy away from the city’s social ills, referencing, for example, poverty (‘A for Ancoats’), pollution (‘I for Irwell’) and the reality of many children’s lives in an industrial environment (alluded to in ‘H is for Heaton Park’). However, it is done with such a light touch that the social commentary slips by almost unnoticed. The artist’s close observation of dress documents many different social ‘types’ in the city. The clogs and shawl of the young girl, and the small boy accompanying her, in too-large boots and hat, in ‘A is for Ancoats’, are in stark contrast to the well- and warmly dressed folk in ‘C for Chorlton’; the market women in ‘S for Shudehill’ a world away from the fashionable family in ‘K for King Street’. Oldham’s satirical gaze can be found in smaller details still: the figure with his back to us in the bottom left of ‘P for Picture Gallery’ would have been recognised in his day as an example of an ‘aesthetic’ type, whose wide hat and knee britches mimicked the dress of the leading aesthete of the previous generation, Oscar Wilde. illustrate here with detail of the two figure groups from A and K Some details from the alphabet may need further explanation: B for Bowdon: The names of the different railway companies are abbreviated. In full they are the Cheshire Lines Committee, the Manchester South Junction and the Altrincham Railway. G for Guardian: Standing in front of the latest edition of the Guardian newspaper are the political rivals of the day, David Lloyd George and Joseph Chamberlain. J for Joule: The ‘old man in his dressing gown’ is scientist James Prescott Joule. His many achievements include work on the relationship between heat and energy, which led to the first law of thermodynamics. He was taught by John Dalton, known for his pioneering work in atomic theory and research into colour blindness, and whose statue stands opposite Joule’s in Manchester Town Hall. N: The vehicle registration plate does not conform to size regulations and so the policeman is making a note of it. Q for De Quincey: In his autobiographical novel, Confessions of an English Opium-Eater, Thomas de Quincey describes his childhood in Greenheys, Manchester. Further reading: Manchester Memories, George Mould (Terence Dalton Limited, Lavenham, Suffolk, 1972).